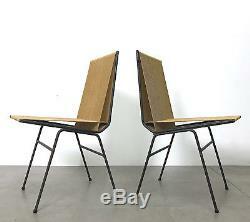 Pair of "Bow" or "String" chairs designed by Allan Gould, USA 1952. Hemp cord seat woven onto iron frame. All original examples, listing is for the pair. Cording is all intact with no breaks. Wear is consistent with age and use. Overall very good to excellent condition give the age. The item "Pair Allan Gould String Side Chairs Iron Woven Cord Mid Century Modern Vintage" is in sale since Sunday, September 24, 2017. This item is in the category "Antiques\Periods & Styles\Mid-Century Modernism". The seller is "20cmodern" and is located in Royal Oak, Michigan. This item can be shipped to United States.